A Labeling Solution that was as Easy as….Pie. Back in 2005, when the Julian Pie Company was experiencing phenomenal growth, the company realized that it needed to add automation to an awkward, labor-intensive operation of labeling and sealing its boxes of freshly-baked fruit pies. Now, after over eight years on the production line, the company knows it made the right decision when it chose labels and a custom system from Weber Packaging Solutions to solve its dilemma. Recently, while exhibiting at a trade show in the area, a few members of our Marketing team decided to swing by Julian Pie Company's bakery to see how things are going now that they've automated their labeling process. 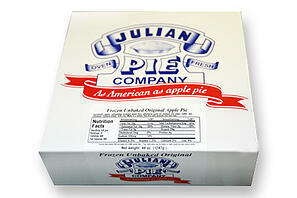 Julian Pie Company was founded in 1986 by Liz Smothers. The company now has two locations, both managed by her sons. 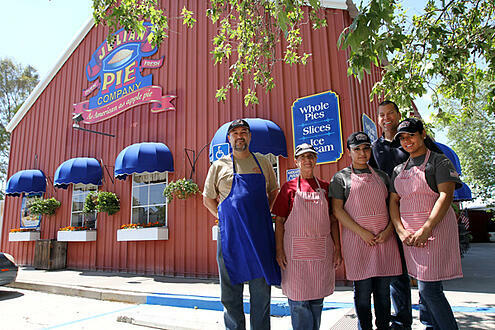 One is a storefront (Julian, CA) managed by Dave Smothers, and the other is a large bakery (Santa Ysabel, CA), managed by Tim Smothers, from which they supply some 600,000 fruit pies a year to Southern California shops and grocery store chains. You can even buy these delicious pies from their website. Julian Pie Company's former method of labeling its pies was to simply to use office supply labels and print them using a standard office printer. The labels were then hand-applied to the pie boxes, and the boxes were sealed with standard cellophane tape. As the demand for their pies grew, they knew automation was necessary to increase productivity and efficiency. After several trips to trade shows to look for a labeling machine, the Julian Pie Company team found our booth at Pack Expo in Las Vegas. "We knew right away that we had a good solution with the Weber system," Tim Smothers said. "We liked everything about it, including the footprint of the machine itself and the fact that Weber manufactured labels, too." The system that Weber engineered was a customized version of its label printer-applicator that included a conveyor and a pair of label wipe-down stations. Now, instead of up to a half-dozen temporary workers, a single operator assembles a paperboard pie box, places the pie inside, and sends it down a conveyor. The Weber label printer-applicator automatically prints a UPC barcode, ingredients and Nutrition Facts information on the label, then gently applies the center area of the label to the front of the pie box as it travels past the conveyor. Just inches away from the initial point of label application, a custom wipe-down station brushes the top portion of the label across the top of the box, then a second wipe-down station immediately brushes the lower part of the label across the bottom of the box, sealing the package for distribution. The Weber pressure-sensitive label material is Flex-Lyte 155 pressure-sensitive film, and the label itself is 6.5 wide and 5" long. The label is preprinted with the Julian Pie Company logo and slogan - "As American as apple pie" - in three colors on a flexographic label press. A portion of the label is left blank for imprinting the variable information of each type of pie as they are being packaged. Our Marketing team found that, eight years later, the printer-applicator and labels are still keeping up with the needs of the Julian Pie Company. And, after some taste-testing, the pie is still as wonderful as ever! To learn more and see the system in operation, check out this video that we filmed at Julian's bakery. 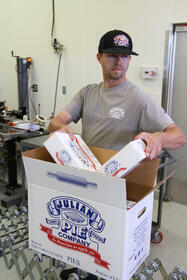 To see more pictures from our trip to the Julian Pie Company, visit our Facebook page. 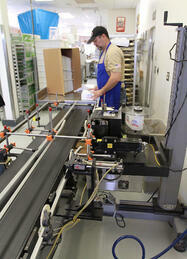 And be sure to contact us if you're interested in upgrading your label process.